Description: Columbus & Greenville and Luxapalla Valley units mix things up in Columbus Miss. Description: The 2880 is well into Run 7 or 8 to make the 10mph track speed into Artesia yard only to have to set and wait and wait some more. The sun was blazing this late Febuary evening, looking more like a late October evening. Description: The 2880 charges by uphill on its way to Artesia. Title: Try to set the night on FIRE! Description: My friend Derrick and Phillip Wages bring the CAGY Xtra West into KCS' yard at Artesia under a setting sun. Now I see what people mean when they say sometimes the setting sun makes the sky appear to be on fire. Description: Thats your photographer up there. Notice the car lights in the background. Description: The 2880 rest in the sun. It was hot this day with the temp around 102 when I was making these pictures. It was a hurried event needless to say. Description: The 2880 plays a game of be still with me. I lost. Description: The 2880 will be switching out cars shortly at a Weyerhauser plant and then on to other customers down the line. Description: Mr. Spencer enjoys the breeze from the cab as the 80' comes thru and leaves Steens all in a couple of minutes time. Description: The 2880 is passing the 912 milepost in this view at Steens, Ms. Description: The 2880 heads out on name sake rails to serve some industries in Alabama. Description: The Luxapalila Valley Railroads sole 2 units set beside the roundhouse. Description: 2880 switches out Columbus Brick. One of a good handful of pics that I wasn't happy about the camera being loaded with B&W film. Overall though I'm happy with the pic. 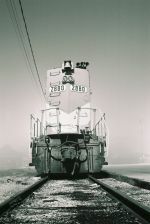 Description: The 2880 pulls ahead during a switching move. Description: Date: Sometime in 2006. The LXVR 2880 backs up to collect some cars and the CAGY 1804 near the yard office. Description: Another CAGY SeverCorr job heads toward the steelmill after picking up cars from the KCS at Artesia. Description: The 2880 and 2000 slide between the 8718 and the 601 on their way with the daily train of scrap metal and mty's to feed the voracious appetite for the new Severr Corr steel mill southwest of town. The 2880 is ex NS (original) exxSOU exxxNS. 2000 is exSOU 2785 exNS 2785 exC&G 2785. 8718 is ex IC with more numbers and owners than I can imagine. 601 is all C&G. Description: A transformer sets idly by this Thanksgiving morning. Description: Moving forward at Don Knotts strength (about 5 mph), the 2880 is on her way to Artesia but as typical with some things, theres always a snag. The trip also includes making set outs for the KCS and at the Port of Columbus. The 80 is rounding the curve where the C&G main ends and is about to hit KCS iron. Description: With her train cut off to the left on the CAGY main, the 80 shoves a cut of 4 back to the set out for the KCS. After dropping these, she'll grab the train from the C&G main and head west to Artesia down the KCS. Description: The 80 shoves her cut of 4 to the KCS at C&G Junction (MP. 14.5) before continuing west to Artesia down the KCS. The KCS Tuscaloosa Sub is the line you see to your immediate left. The building you see off in the distance is the old Seminole Clothing Company. I wouldn't doubt that at one time that they weren't a customer of the lines original owner, the M&O or GM&O. This line from MP. 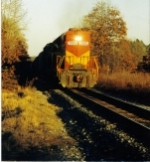 17 onwards to Tuscaloosa and Brookwood, Alabama is leased to and operated by Watco's Alabama. Description: The 80 heading out of Columbus for Artesia with a late winter late afternoon freight. Description: Virgil adds some sand to the 2880 as the scrapping of old locomotives goes on and clutters the fore ground. Description: The prime mover of the 801 is lifted from the frame as the 2880 looks on. Description: The 2880 is started up as the 801 is shut down for good as her prime mover is lifted from her frame and set to the side of that of another. Description: Just after midnight, the Columbus switcher pauses for a few moments after getting a track warrant from the KCS to head out to the steel mill with 8718 and 1002 having the honors. It was nice to see 2 units in fairly matching paint banging them around together, doesn't happen often on this line. Title: Ever Have The Feeling You Are Being Watched? Description: As I'm getting ready to get my pics of the 2880 heading to Artesia, KCS personel drove by and strained their necks then turned around to do it again. Suprisingly I wasn't run off. Artesia was once railfan friendly but after KCS came to town that pretty much came to an end. Description: ...that you get to see the LXVR's entire roster together let alone teaming up to lead a frieght. They are both making last minute additions to the days train before heading out for Artesia.